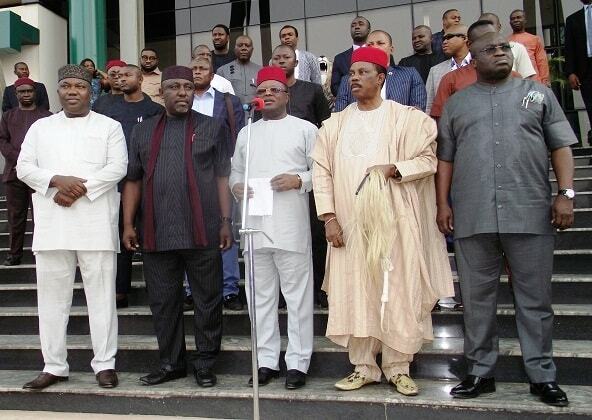 Proscription of IPOB by southeast governors is typically a building without foundation. I have come to understand that the so called eastern governors thought that IPOB could be bribed with money and lucrative contracts; however, they have been proven to be- not only a bunch of cowardly and inept politicians; but also a group of frustrated and a confused people. The indigenous people have taken their stand under the leadership of Mazi Nnamdi Kanu. And we have only one demand from the Nigeria government, which is none other than an internationally monitored referendum, else there will be no more election in Biafra land starting from Anambra state. The time of darkness is gone, for light has taken over. Power has returned to the people. Since Nigeria got independence on a platter of gold, Biafrans have been subjected to all manner of marginalization and persecution. The so called politicians, especially the ones we have in Biafra land know we are graduates without job, yet they maintain absolute silence in utmost hypocrisy. But now is the time we have chosen to take the bull by the horn. The eastern state had since been taken as slave to the northerners due to the power given to them by the British government as a result of the resources that comes out of Biafra land. Since all these years, Biafrans have been marginalized in many ways: both economically, educationally, socially, and even politically. In all this, none of the serving and past governors in the south east challenged the ill maltreatment of their people by the federal government until the God in heaven (Chukwu Abiama) sent his beloved son in the person of Prince Mazi Nnamdi Kanu, to come and save his people from the enclave of the Nigeria state. Instead of encouraging him as the mouthpiece of Biafrans, the slave politicians that call themselves governors, conspired against him in alliance with the Hausa Fulani army and their master Sultan of Sokoto to eliminate the IPOB leader who has not less than 70million followers all over the world. Till date, Nnamdi Kanu's whereabouts is unknown after the bloody assassination assault in his residence at Afara-Ukwu. As a result of the evil embedded in the group of cowardly politicians that call themselves southeast governors, they hurriedly collaborated with the murderous Nigeria government to proscribe their own people. The same people that voted them into power. They mocked Biafrans as Nigeria government declared IPOB terrorists. They think that such exhibition of ignorance can prevent or quench the restoration of Biafra. How mistaken they are, because just an order from the revered IPOB command, they will realise how grievously a blunder their proscription is, and why it does not exist. Isn't it very laughable that the kindergarten proscription statement from the governors was announced without even passing through their respective house of assemblies? The state law makers themselves are also negligent of their duties for not moving motions for the governors impeachment. The proscription of IPOB is a ploy to scuttle and derail our quest, however, such is dead on arrival because our destiny can't be denied due to an illegal proscription that can never see the light of the day. You can't fool people forever. Therefore, it is time the so called southeast governors started preparations to go on exile, because the time of reckoning is at hand and there will be definitely no hiding place for them. This same south east governors are owing pensioners and civil servant their arrears and salaries for one year and above. Many pensioners and civil servants have died through sickness,hunger, frustration and high blood pressure, in the process of waiting for the settlement they laboured hard for. Now they want to lobby and deceive people to drop the agitation for Biafra instead of paying the huge debt their respective states are owing the masses. IPOB has made the ultimate demand which is Biafra. It is the only thing that can make the souls of our fallen heroes and heroines to rest in peace. Therefore, it is time these shameless governors and inept politicians stopped betraying their people. They must realize that both the dead, crops, animals, unborn child, and even the wind are in need of Biafra. The earlier they have a rethink, the better for them because the day of judgment is fast approaching. IPOB would rather die than remain in this animal kingdom called Nigeria.